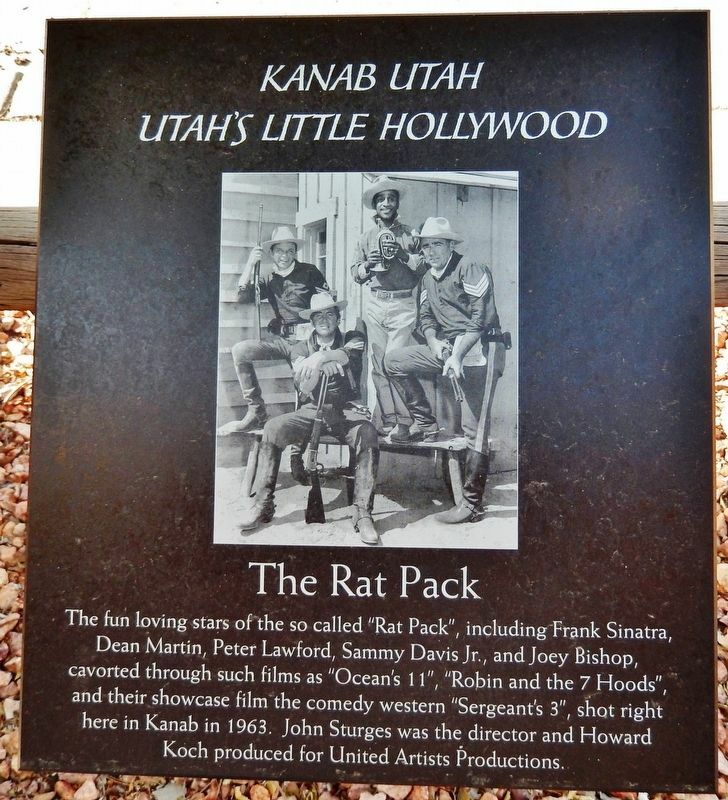 The fun loving stars of the so called "Rat Pack", including Frank Sinatra, Dean Martin, Peter Lawford, Sammy Davis Jr., and Joey Bishop, cavorted through such films as "Ocean's 11", "Robin and the 7 Hoods", and their showcase film the comedy western "Sergeant's 3", shot right here in Kanab in 1963. 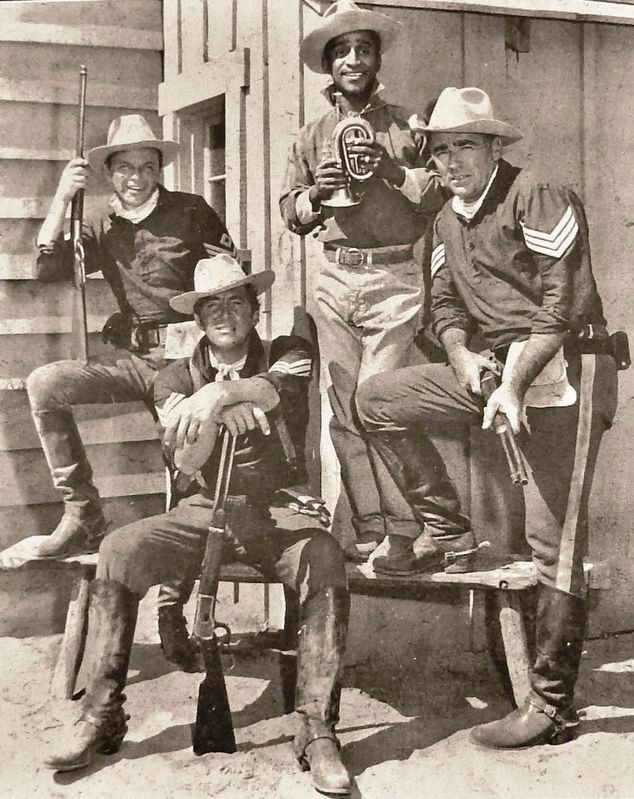 John Sturges was the director and Howard Koch produced for United Artists Productions. Location. 37° 2.882′ N, 112° 31.758′ W. Marker is in Kanab, Utah, in Kane County. Marker is on West Center Street (U.S. 89) west of Main Street, on the right when traveling east. Touch for map. Marker is located along the sidewalk on the south side of the street. 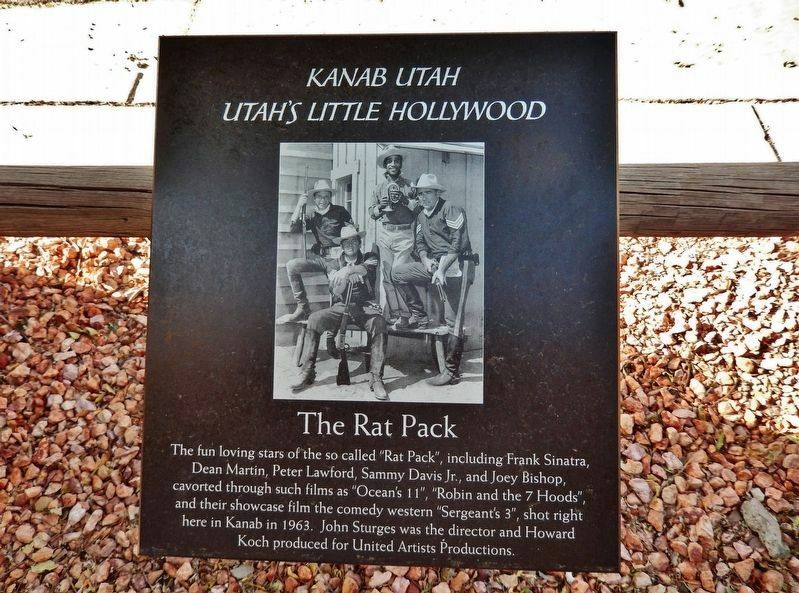 Marker is at or near this postal address: 29 West Center Street, Kanab UT 84741, United States of America. Touch for directions. (within shouting distance of this marker); Daniel Boone (within shouting distance of this marker); Sidney Poitier (within shouting distance of this marker); Linda Darnell (within shouting distance of this marker); Ken Curtis (within shouting distance of this marker). Touch for a list and map of all markers in Kanab. More. Search the internet for The Rat Pack. Credits. This page was last revised on March 7, 2019. This page originally submitted on March 5, 2019, by Cosmos Mariner of Cape Canaveral, Florida. This page has been viewed 33 times since then. Photos: 1, 2, 3. submitted on March 5, 2019, by Cosmos Mariner of Cape Canaveral, Florida. • Bill Pfingsten was the editor who published this page.